When I was younger, I was a huge fan of Judy Blume. Somehow she was able to show the silver lining to the challenges of being a young girl in a way I could relate. I would spend all my free time reading her books, and always hated turning over the last page, knowing I'd have to wait a while for a new book to come out. As an adult, I find myself still reading every night, just enjoying the opportunity to lose myself in a character that places the stresses of the day far away... at least for a little while. My latest guilty pleasure was a book titled You Knew Me When by Emily Liebert. I immediately empathized with the challenges her characters were experiencing as they were not too different than those I had experienced in my younger years. I either read too fast, or the book ended too soon. I have been waiting for word of a film debut or television series launch ever since! You had great success with your debut novel, You Knew Me When. Tell us about that. Yes! I'm very proud to report that You Knew Me When did extremely well, especially for a debut. It was a Bookscan bestseller within the first couple of weeks and the publicity it received was outrageous thanks to my "dream team," as I affectionately refer to them. Also, my partnership with the nail polish brand Zoya, was a huge help in garnering publicity. They created the stunning "You Knew Me When" collection with three customized polishes named for my characters. 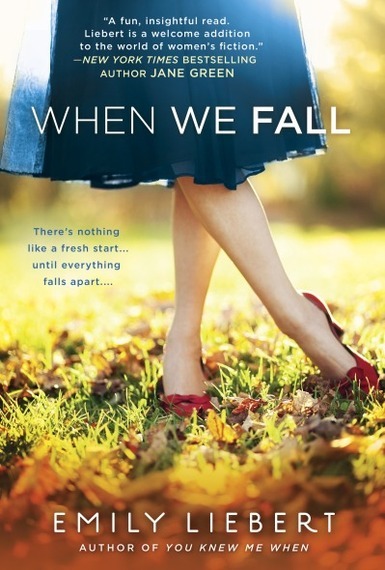 Your new novel, When We Fall, comes out in September. Can you give us a sneak peek? Absolutely! I'm very excited about this novel because I really pushed myself to create real, flawed characters who readers would love, love to hate, and identify with all at the same time. The story follows Allison Parker who's just moved back to her hometown in the suburbs of New York with her 10-year-old son Logan. While she'd once savored the dynamic pace of city life, sadly, it lost its allure after her husband's untimely death. Now, ready for a fresh start, what Allison doesn't anticipate is that her past will resurface. When Charlotte Crane, the wife of her husband's best friend from summer camp takes her under her wing, things begin to spin out of control. Will When We Fall have any partnerships like you had with You Knew Me When? Do we see another nail polish color in our future? Yes! I will be announcing a very cool partnership that I think a lot of my readers will want to get involved in soon! You Knew Me When had Hollywood producers calling. Any word on that? What about When We Fall? I was very fortunate that You Knew Me When raised heads in Hollywood early on. I'm still in talks to have it developed into a TV show, so fingers crossed! That said, I think When We Fall is an even more natural fit for the big or small screen. It explores loss, love, friendship, and the lengths we have to go to in order to find our happiness. Where do you find the inspiration for your characters and plots? From my own life, friends, and family. I always tell people, you better be nice to me, or else you might be the villain in one of my forthcoming books! Speaking of forthcoming books, what can we expect next from you? Well, I just got another two-book deal from Penguin Random House, so I'm currently working on my fourth and fifth books. The plan is to publish a new novel every nine months, and I'm down with that! You have young kids too, right. How do you do it all? I don't do it all! I do the best I can each and every day. I have two boys, ages 3 and 4. I work hard. I play hard. I don't have too many leisure hobbies at the moment! Emily, thanks for sharing and I can't wait to get a copy!